A collision of three fortunate events recently occurred. First, we were hosting the Oregon Duck football game party. Second, my sister-in-law delivered half of a grass-fed cow to my freezer. 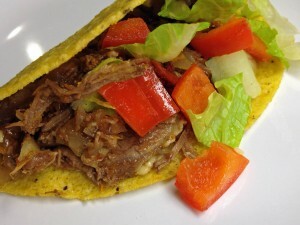 Third, I found a fantastic crockpot shredded beef taco recipe on a food blog called Give Me Some Oven. Oh, baby, this stuff is good! I made more than a double-batch, and all I had left to show for it was one measly taco worth of meat! Some would call this Barbacoa. But, there are so many definitions of Barbacoa! So let’s just say that this is a recipe for smokey, spicy, fall apart and melt-in-your-mouth shredded beef used for serving epic tacos. Yep, that’s it. I highly recommend serving these tacos with some “Go Ducks” Guacamole. Start early! You want this to cook on low for 10-12 hours…especially if you do a double-batch like I did. Heat olive oil in a large, heavy skillet over medium-high heat. Meanwhile, stir together chili powder, cumin, and smoked paprika in a small bowl. Rub the spice mix all over the beef then place beef into the skillet. Lightly brown each side of the roast. Leave the heat on the skillet, but remove the roast from the skillet and place in the crockpot. Add stock to skillet and scrape up any bits from the bottom of the pan. Add in tomato paste and minced chipotle and whisk into the pan sauce. Simmer for a few minutes to thicken sauce. Put the chopped onion and minced garlic on top of the beef in the slow cooker. Pour the warm sauce over the top. Cover and cook on low for 10-12 hours. About an hour before serving, remove the beef from the slow cooker and shred and pull apart with two forks. Place meat back in slow cooker to let all of the flavors really mix for another hour of cooking. When it’s time to eat, use a slotted spoon (I used my spaghetti straining spoon) to strain the meat and onions and transfer to a serving bowl. Serve the beef in the flour or crisp tortillas, topped with your favorite taco toppings.